In terms of global consumption structure, molybdenum is indeed an ally of iron. The demand for molybdenum in western developed countries is 80% from steel, 30% from stainless steel, 30% from low-alloy steel, 10% from drilling and cutting tools, and 10% from cast steel, and the other 20 percent of molybdenum consumption is in molybdenum chemicals, molybdenum-based lubricants, and petroleum refining. In addition, molybdenum-based alloys have been widely used in electronic, metal processing and aerospace industries. The TZM alloy has the excellent high-temperature strength and comprehensive properties and is the most widely used molybdenum alloy. In the United States, engine turbine discs are made of TZM alloy, and the molybdenum accounts for 15% of total molybdenum consumption. TZM and TZC molybdenum alloys have better mechanical properties than pure molybdenum and are widely used in the manufacture of high-temperature tools, molds, and various structural parts. Seamless tube made of molybdenum-rhenium alloy (containing 50% Re) has excellent high-temperature performance and can be used at the temperature close to its melting point. It can be used as the support, ring, grid and other parts of the thermocouple sleeve and electron tube cathode. Molybdenum and molybdenum alloys not only have high-temperature strength, good electrical conductivity, thermal conductivity and low thermal expansion coefficient (similar to electronic pipe glass) but also have the advantage of easier processing than tungsten. Therefore, molybdenum plates, molybdenum belts, molybdenum foils, molybdenum tubes, molybdenum bars, molybdenum wires and profiles produced by conventional processing methods have been widely used in electron tubes, electric light source parts, metal processing tools, and turbine discs. As an ally of steel, molybdenum, along with nickel and chromium, is used as an alloying element to reduce brittle changes that often occur in alloy steel during heat treatment. It is calculated that molybdenum has twice the capacity of tungsten so that 18% of steels containing tungsten can be replaced by 9% of steels containing molybdenum (with the addition of chromium and vanadium), which greatly reduces the production cost of steel. 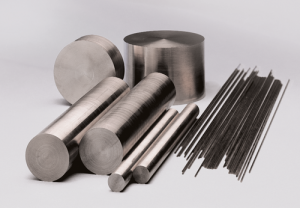 The function of molybdenum in stainless steel is to improve corrosion resistance, high-temperature strength, and weldability, and it can be seen that molybdenum plays an extraordinary role in the steel industry. Molybdenum has very low steam under the temperature and pressure of the vacuum furnace so the molybdenum parts have the least pollution to the workpiece or working material in the furnace, and its evaporation loss certainly does not limit the service life of high-temperature molybdenum parts such as heating elements and heat shield seals. In the manufacture of glass products, the high temperature strength of molybdenum makes it the most ideal electrode and processing equipment during rapid heating. Molybdenum is chemically compatible with most glass components and does not cause harmful color effect due to the small amount of molybdenum dissolved in the glass melting groove. As the heating electrode in glass melting furnace, its life can be up to 3 ~ 5 years. Stanford Advanced Materials supplies high-quality molybdenum and molybdenum alloy products to meet our customers’ R&D and production needs. Please visit http://www.samaterials.com for more information.